Speaking personally, I love it when BBC Parliament re-shows general election television coverage in order to mark general election anniversaries, and I know I'm not alone with my enthusiasm. You see the story of the election unfold, 'in real time' with all the drama, spontaneous and unrehearsed interviews with the politicians, and members of the public, with the occasional 'stumbles' that you would expect from a live broadcast. It's like entering a time capsule. On 21 February, BBC Parliament repeated the general election coverage from February and early March 1974. In addition to this rich source, I also enthuse about the insights about these past events given by the public records, held by the National Archives. More about this later. 40 years ago today, on 28 February 1974, a general election was being fought, amid a major economic crisis. Prime Minister Edward Heath had called a snap election, and had asked a renewed mandate from the British people – appealing to them to return a 'strong government, able to take firm measures in the national interest', to quote from the Conservative manifesto. Heath had gone to the country during an all-out miners' strike, and despite the fact that Heath 'was determined not to make the election a confrontation between the government and the miners' , the election campaign became focused on the question of 'Who Governs? – the Unions or the Government? The result of the election was very close, and the Prime Minister's disappointment –and a degree of bewilderment – is captured in the Confidential Annex to a Cabinet Meeting on Friday 1 March. It was the first 'hung parliament' since 1929. Although Labour won fewer votes than the Conservatives, Labour won more seats, 301 as opposed to 297. The Liberals won 14 seats but secured 19% of the national vote. The mere fact that a Cabinet meeting, for the incumbent government ministers, was taking place at all on the day after an election was highly unusual. What was going on? The Cabinet minutes, which are available online on the National Archives website, provide the answer. Heath, addressing the Cabinet, spoke about the need to 'consider carefully whether in a situation where the two main parties were so close, where the Conservative Party had obtained the majority of the total votes cast and where nearly six million votes had also been cast for the Liberal Party, the nation would expect him to attempt the formation of a right-centre coalition before handing power to the Labour Party'. Heath saw it as his patriotic duty to attempt to form such a coalition. He duly secured the Cabinet's agreement that he should consult with the leader of the Liberal Party, Jeremy Thorpe, about the possibility of a coalition or an agreed programme for the short-term. Heath asked the members of his cabinet to remain in London over the weekend so that he could consult them further following negotiations. The Cabinet minutes also include a significant sentence about the public relations aspect: 'in the meantime no indication should be given to the Press of the Government's intentions'. Instead, a press statement would be issued, merely stating that the Prime Minister was going to report to the Queen on the situation. This sort of 'minimalist approach' to public relations would not be tolerated in the modern era of 24 hour news culture. Referring to the General Election of May 2010, when it became apparent that no party would achieve an overall majority the three main party leaders made public statements regarding the options for forming the next government with the other parties. Heath did authorise a public announcement at lunchtime on Saturday 2nd March about his meeting with Thorpe – but the approach was to strictly 'ration' announcements. One of the highlights of the BBC General election coverage from February 1974 was the sight of a young David Dimbleby, with coiffed hair, as a BBC reporter outside No 10, carrying out spontaneous 'vox pop' interviews with members of the public - mostly dressed in shades of beige or brown - who were crowded on the pavement opposite No.10, waiting for news of developments (there were no gates at the end of Downing Street in those days). The National Archives holds a fascinating document (PREM 16/231) which chronicles the story of Heath's attempt to form a coalition with the Liberal Party. 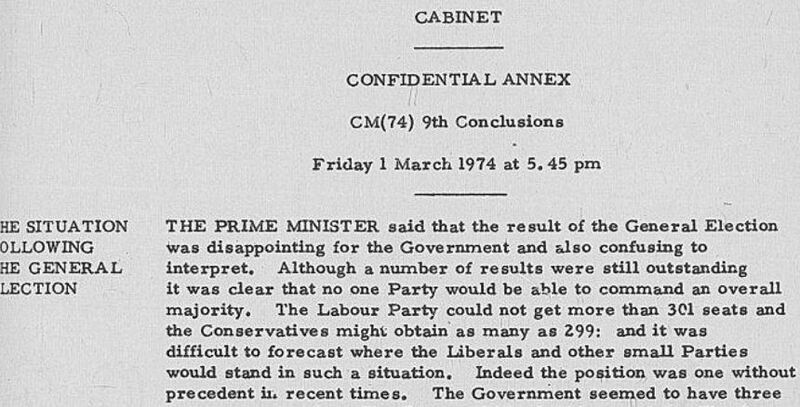 Compiled by Cabinet Secretary Robert Armstrong, his 'note for the record' is entitled 'events leading up to the resignation of Mr Heath's administration on 4 March 1974'. There are some surprising and colourful details within this document. For example, it refers to the difficulties that Edward Heath encountered in trying to get in contact with Jeremy Thorpe – on the Friday he was leading a triumphant torchlight procession around Barnstaple. Then there was a fault with Mr Thorpe's telephone (some would say – 'how very 1970s!') which meant that the two leaders did not get to speak until gone midnight. Thorpe accepted Heath's invitation to come to Downing Street at 4 pm on Saturday (2nd March). Thorpe was determined to get away from his home in North Devon without attracting press attention. As the Armstrong memorandum reveals, Thorpe later told the Prime Minister of the plans he had made: 'he had sent his car, with a bag, to a neighbouring farm to await him. Then he had donned a country coat and wellington boots over his town suit, walked across three wet fields to the farm, and driven from there to Taunton. He had thus managed to avoid the waiting journalists. Even so, he found one waiting for him when he arrived at Taunton station'. These colourful details add a different dimension to the story! From 1-4 March the nation waited for the outcome of the negotiations, but the talks foundered. The main issue was that the Liberals demanded a commitment to electoral reform from the Conservatives, but at most the Conservatives would only offer an inquiry into the subject, and this did not satisfy the Liberals. Also, having taken soundings from his party Mr Thorpe told Mr Heath of a 'lack of enthusiasm for a proposition such as you suggested, either opposition support or coalition support, in the light of your own position as PM: the feeling being that you called an election and failed to get the mandate you sought' – this was tantamount to saying that the Conservative leader would be expected to stand down as prime minister as part of an agreement – the Cabinet were not prepared to agree to this. There are some poignant details in Armstrong's 'note for the record' about Heath's last hours as Prime Minister. And so Labour returned to power - Harold Wilson entered 10 Downing Street as Prime Minister for the third time on 4 March 1974. However, as Labour was short of a majority by 17 seats, another election was not far away. Keep tabs on the past. Sign up for email updates from this blog.